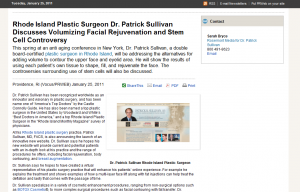 Dr. Sullivan in the News: Facial Rejuvenation and Stem Cell Controversy - Patrick Sullivan, M.D. This spring at an Anti aging conference in New York, Dr. Patrick Sullivan, a double board-certified plastic surgeon in Rhode Island, will be addressing the alternatives for adding volume to contour the upper face and eyelid area. He will show the results of using each patient’s own tissue to shape, fill, and rejuvenate the face. The controversies surrounding use of stem cells will also be discussed. Dr. Patrick Sullivan has been recognized worldwide as an innovator and visionary in plastic surgery, and has been name one of “America’s Top Doctors” by the Castle Connolly Guide. He has also been named a top plastic surgeon in the United States by Woodward and White’s “Best Doctors in America,” and a top Rhode Island Plastic Surgeon in the “Rhode Island Monthly Magazine” survey of physicians. At his Rhode Island plastic surgery practice, Patrick Sullivan, MD, FACS, is also announcing the launch of an innovative new website. Dr. Sullivan says he hopes his new website will provide current and potential patients with an in-depth look at his practice and the range of procedures he offers,including facial rejuvenation, body contouring, and breast augmentation. Dr. Sullivan says he hopes to have created a virtual representation of his plastic surgery practice that will enhance his patients’ online experience. For example he explains the treatment and shows examples of how a multi-layer face lift along with fat injections can help treat the deflation and laxity that comes with the passage of time. Dr. Sullivan specializes in a variety of cosmetic enhancement procedures, ranging from non-surgical options such as BOTOX Cosmetic®, to more complex surgical procedures such as facial contouring with fat transfer. Dr. Sullivan says he and his team take an individual approach with each patient throughout the entire process of aesthetic enhancement. From the initial consultation to the final period of recovery, Dr. Sullivan says he strives to achieve his patients’ cosmetic enhancement goals. He adds that he believes the practice’s new website will further contribute to his ability to both educate and satisfy his patients’ expectations. By providing detailed descriptions of all procedures offered, as well as patient before-and-after galleries, patient perspectives, educational video gallery and social media links, Dr. Sullivan says he hopes to create a supportive online community centered on his Rhode Island plastic surgery practice. Whether he is performing a neck lift, eyelid surgery, or tummy tuck in Rhode Island, Dr. Sullivan says the website was designed to provide his patients with an informative and educational resource, which he believes is fundamental to the formation of a lasting patient-doctor relationship. Patrick K. Sullivan, MD, FACS earned his medical degree from the Mayo Medical School in Minnesota, and has completed residencies at the University of Colorado and Brown University. He is certified by the American Board of Plastic and Reconstructive Surgery as well as the American Board of Otolaryngology. Dr. Sullivan is a fellow of the American College of Surgeons, and is a current faculty member at Brown University’s School of Medicine. He has been published in a number of professional journals, and lectures extensively throughout the U. S., South America, Canada, and Europe. Dr. Sullivan’s plastic surgery practice is located at 235 Plain St. Suite 502 in Providence, RI 02905, and can be reached at (877) 435-3223. Dr. Sullivan can also found online at http://www.drsullivan.com/ or at his Dr. Patrick K. Sullivan, Rhode Island Plastic Surgeon Facebook page.